june 5, 2000. Every year at the beginning of the summer, the citizens of San Francisco engage in an intricate gavotte. Bureaucrats bow and scrape; petitioners twirl and curtsey. It’s known as the Budget Process. On one level, it presents the American democratic system at its finest — and its messiest. The musicians have once again begun to tune their instruments. Last week Our Mayor presented his budget to the populace at large. The denizens of City Hall began to limber up, preparing to righteously defend requests for increases and enter into tooth-and-nail battles to prevent cuts. Essentially a status quo budget in a period of burgeoning prosperity, the city departments will actually lose ground by standing still. Finance Committee chair Leland Yee moved the process outside Civic Center confines, traveling to every corner of the city to discuss the forthcoming deliberations with We-the-People. In this city of unabashed diversity, every district hugs its own interests close to its bosom. Yee did his homework, consulting with local leaders to determine which issues were dear to their neighbors’ hearts and bringing experts along who could expound on them. For even as seasoned pol as Yee, these hearings must be eye-openers, for one rarely receives such a thorough overview of day-to-day concerns. The final two public meetings, held back to back, offered lessons in contrast. Tuesday, May 30, about 70 people gathered in Horace Mann Middle School, in the heart of the Mission. 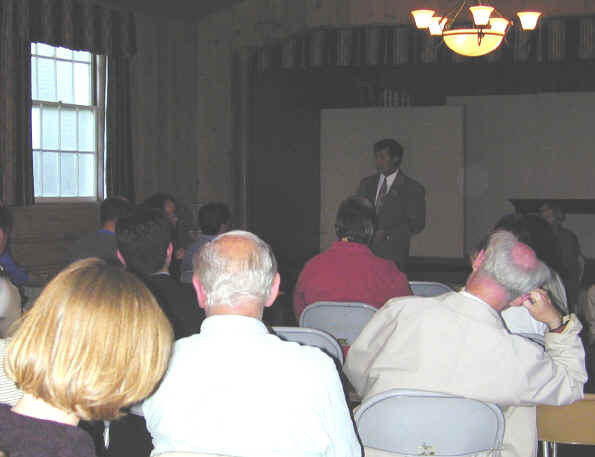 The meeting in the auditorium recalled back-to-school nights everywhere, with speakers positioned in front of a brightly decorated stage, addressing an eager group of adults and children. In addition to Yee, three — count them! — three police officers spoke, along with Maggie Donahue of Human Services. 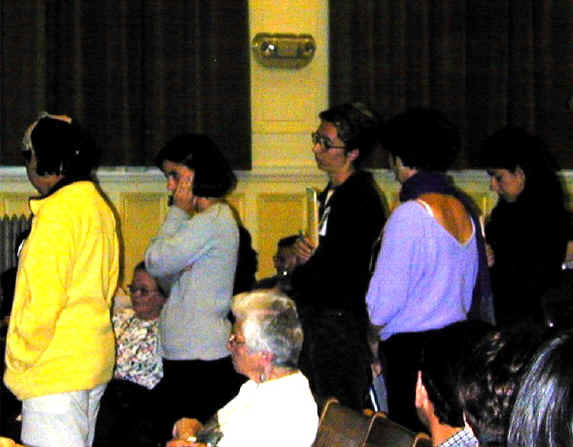 Many members of the audience wore earphones, so that a simultaneous translator could guide Spanish-speaking listeners through the proceedings. The Mission is nonprofit heaven, and many in the audience wore the slightly frazzled, friendly air of service providers, greeting one another like alums at a college reunion. During the public comment period, a line of people stretched from the microphone all the way down the center aisle to the back of the room. The room resonated with a sense of urgency. Said Matt Brown of St. Peter’s Housing Committee, "The mayor insists that we should set aside a portion of our funds for a rainy day. Let him look outside. It’s pouring!" Familiar voices raised familiar subjects — Brown, Jennifer Friedenbach from the Coalition on Homelessness, Riva Enteen from the National Lawyers Guild — in an ongoing fight against the three demons of homelessness, poverty, and inadequate health care. But most of the speakers were private citizens, drawn by a private need to make a public official understand the importance of threatened institutions in their lives. Gratitude and anguish mingled in their accounts of mentally disturbed children who had found stability in the Mission Family Center and acutely ill patients who had received care at SF General, two understaffed facilities facing further cuts in services. Wednesday, May 31, Yee climbed the hills to meet with folks living west of Twin Peaks. Here, too, the official speakers gathered in front of a stage: for decades Miraloma Clubhouse has been a venue for amateur performances. In response to local concerns, three — count them! — three representatives from Rec and Parks attended, along with Deputy City Librarian Susan Hildreth and Maggie Lynch from MUNI. They addressed an audience of about 30 informed and opinionated people who confidently cited names and numbers to support every question they raised. Although issues of poverty remained far in the background, these people echoed their Mission counterparts’ sense that the city isn’t working. San Francisco has long ignored the western districts when handing out goodies, and the City Hall representatives were forced to endure a litany of complaints about potholes, unusable parks, and reckless bus drivers — basic infrastructure problems that average citizens assume their tax dollars are meant to fix. What’s a good politician to do under the circumstances? Provide sympathy, promise changes, and offer follow-up information. The evening elicited many vows of strict accountability. In any other city, such a display of civic responsibility by both office holders and voters would merit front-page coverage in the dailies. Here, we take it for granted that citizens will speak out intelligently and be heard patiently. But this month’s dance is surely accompanied by some rather energetic maneuvering offstage, and that’s interesting. Lacking privileged knowledge, I can only speculate. I wonder if you have reached the same conclusions. For the past three years, the budget hearings have had a shadow, a parallel process initiated outside of and in opposition to the official one. It’s called the People’s Budget. No pie-in-the-sky spendspendspend program, this proposal is a respectful attempt by people involved in the city’s daily functions to find an alternative to official approaches that they consider failures. They take seriously the Board of Supervisors’ declaration of support in 1998 for the Universal Declaration of Human Rights, including the clause that reads, "Everyone has the right to a standard of living adequate for the health and well being of himself [herself] and his [her] family, including food, clothing, housing, medical care and necessary services." Sounds a bit like the flower children calling their federal parents to task for ignoring the basic strictures of the Constitution. Three years ago, the People’s Budget Collaborative began as a small coalition of service organizations. Today it includes more than 40 groups, ranging from the Coalition for Ethical Welfare Reform to the US PROStitute Collective. Last year its active involvement in the city’s budget hearings not only publicized overlooked needs but actually pushed the solons toward beneficial changes. This year it has already entered the arena, with representatives visibly present at the neighborhood meetings. This year its message is no longer new. This year its reception appears to be warmer than ever before. But its message is not floating in a vacuum. It has sailed into the middle of a new political configuration where local politics radiate significance: it has managed to land smack dab between last year’s mayoral election and this fall’s district elections. Suddenly, neighborhoods have become genuinely important. The time-old tradition of center-peripheral struggle will soon play itself out in our polling places. In the San Francisco of tomorrow, the neighborhoods can achieve genuine power if they are willing to collaborate; but if the politics of the center can keep them divided, they will once more be relegated to the role of traditional totems requiring occasional ritualistic obeisance. You can’t go home again, but perhaps you can fight City Hall. The weeks to come will tell if the old-style Democratic County Central Committee’s hold on voting behavior has loosened, ushering in a slew of new elected officials to roil bureaucratic waters. But a preliminary match is underway right now, in the battle between the two budgets.